Local Lady Media is an entertainment and humor blog covering everything from local and pop culture, from TV, and movies, to life's random adventures through the eyes of local Virgin Islands eccentric Judgey Johannes--self-crowned Miss Media 2016 to life--who has an appetite for providing commentary on shenanigans because there is no shortage of foolishness/interesting things in the world. ST. CROIX — Even though I knew it was coming, I wasn’t prepared for how it would feel. I cried every day during the final semester of my undergraduate year. Between current expectations and the nearing future I realized that I wasn’t ready to graduate. Senior year is romanticized. Seniors are expected to have their lives planned out. This was what they have been preparing for the moment they left high school and entered institutions of higher learning. These students are expected to be bold and brave, bearing smiles and excitement for the coming of May when it will all be over. Few realize that, while exciting, senior year is overwhelmingly stressful. After several years, their lives are summed up in a month. May doesn’t mean the same thing anymore for graduating seniors. 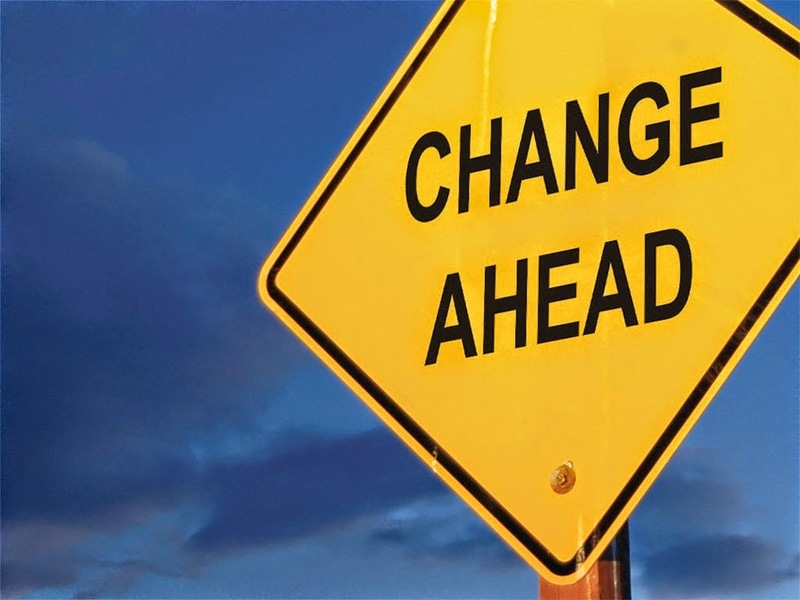 It is a month of changes. Dr. Aletha Baumann, associate professor of psychology at the University of the Virgin Islands, recounted a situation where a student broke down in front of her. Graduation is a big transition that often causes students to feel depressed or anxious. Will they find a secure job right out of college? What do they do with their degree? Will they find a job within that degree? After finding a job they must now budget, decide living arrangements, make new friends and say goodbye to old ones. It is a period of leaving the familiar and meeting the unfamiliar. In a 2014 article by US Health News, Vicki Hays, director of Counseling and Psychological Services at the University of Michigan, said graduation depression is more common than many think. For some students, the problem wasn’t leaving college. The problem was the process in order to leave there. 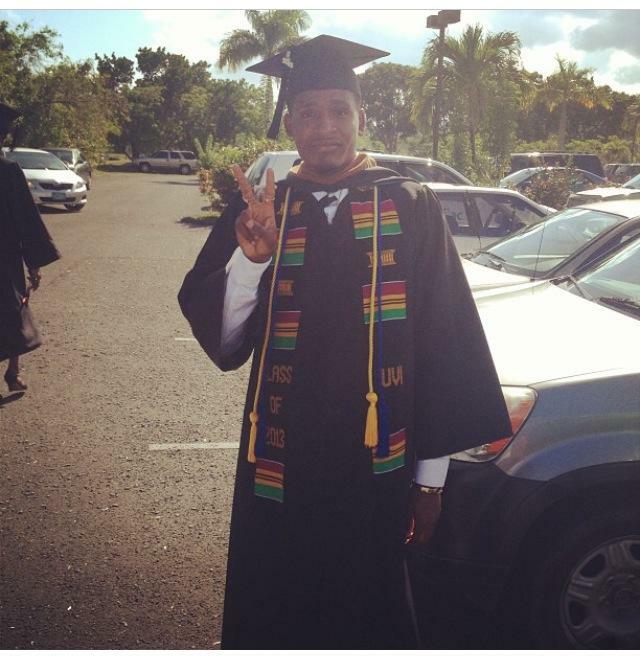 Lorie Jeffers graduated from the University of the Virgin Islands with a Bachelor of Arts in Psychology last May. According to her, there were personal points of depression for herself and her fellow classmates. Jeffers also said that the stress levels among herself and her peers were unstable. “In between our moments of despair and depression were lots of moments of triumphs and victories. However sometimes it felt like for every victory there was a setback,” she said. A 2001 article in The Guardian stated that while one in four students suffer depression during their university years, there aren’t any official statistics for the post-graduation nor pre-graduation period. In the article, Mike Burton, of the Sussex University Counseling service, said that this group “slips through the system.” These students become indivisible from any other adult going through transitions and even counselors are unaware of the problem. Patricia Towal, director of counseling and career services at the University of the Virgin Islands, said that while students do come in for counseling, she wished there were more. Baumann also agreed that students in their final semester need that extra counseling to cope with their difficulties. “This is the time people should be talking to counselors about life especially if you’ve never been stressed like this before,” Baumann said. Many students, however, admit that they do not seek counseling in their final year and that is mostly because they handle the feelings of stress and anxiety on their own. Deidre Dubois, senior psychology major at the university, said that rather than see a counselor, she took a day off. Dubois also said that between school, her daughter, and other personal struggles, she felt like jumping off of a cliff. Another psychology senior, Shanah Bannis, also didn’t see a counselor to handle her stress. However, despite the call for counseling, Aletha Baumann felt that many of the students were not at clinical levels of depression and anxiety, which is why there are very few studies on the topic. According to Baumann, many students often use the word “depressed” as a way to express unfamiliar stress and sadness. Towal agreed that many of the students appeared to show signs of stress rather than clinical depression or anxiety. However, while the students at the University of the Virgin Islands are overwhelmed, Baumann believes that they are the type of students that overcome easily. With the help of great advisers and peers, the struggles of coursework and the nearing future become minuscule troubles. If it weren’t for the constant reassurance and kind words from my professors I might have given into the pressures of my senior semester and crumbled. Thanks to them I, and many of my peers, will not only be graduating in May, we will be evolving and becoming ready for the world after graduation. 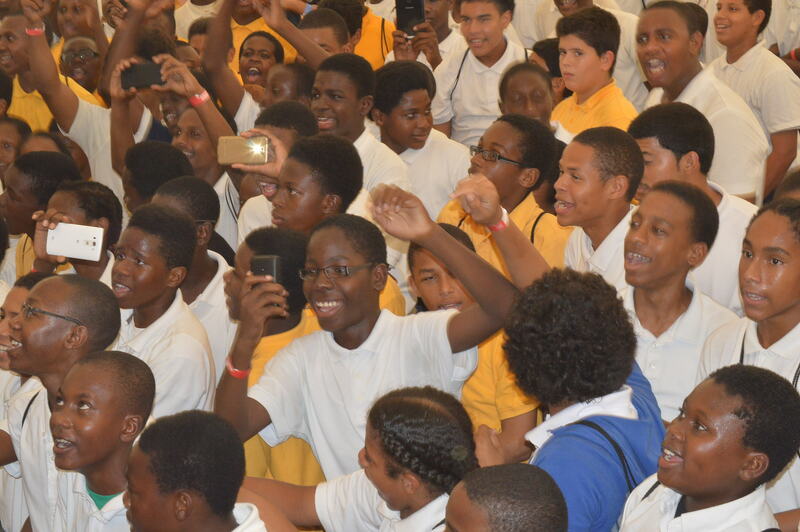 ST.CROIX- The young men of the local high schools came out by the busloads, to participate in the fifth annual Man- Up Male Empowerment Conference, Wednesday, Feb. 11 on the Albert A. Sheen Campus grounds. The conference, hosted by the University of the Virgin Islands, the V.I. Education Department and V.I Human Services Department, is an initiative that was started by the university’s president, Dr. David Hall, as a way of helping young males to realize their full potential and attract them to the university. Christopher Gardner, the author of the best-selling book, ‘Pursuit of Happiness’, was the keynote speaker of the conference. His rags-to-riches story has been an inspiration since the inception of his book, which was later adapted into a movie starring famous actors , Will Smith and his son, Jaden Smith. “I never went to college a day in my life. I went to work,” Gardner said. Throughout his speech, Gardner paid special tribute to his mother, Bettye Jean, citing her as his main motivation and the person who pushed him toward success. He also showed the young men in the audience a picture of her in his PowerPoint display. Gardner’s son, Christopher Gardner Jr., was also in attendance. After Gardner’s speech, the 850 students who were seated under the big white tent on the campus grounds were treated to a performance by local-turned-international duo, Planet VI aka Rock City. 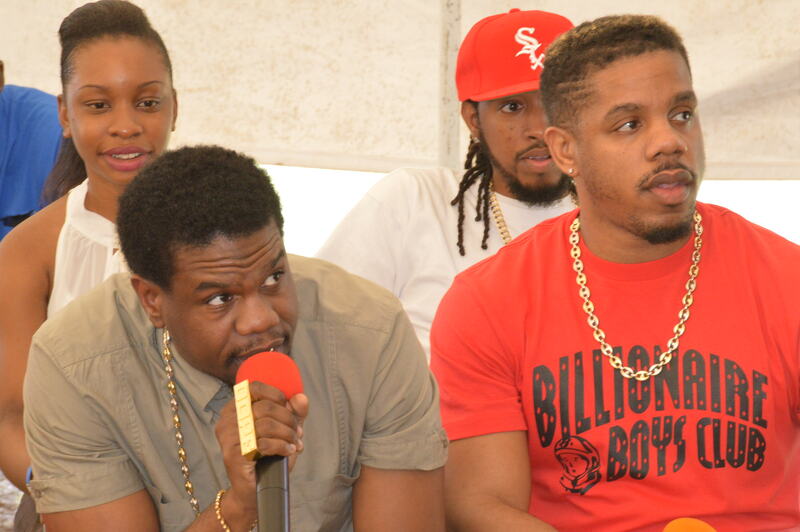 Thomian natives and brothers, Theron and Timothy Thomas, who have written and produced songs for artists such as Nicki Minaji, Chris Brown, Akon, Rihanna and other top celebrities, brought the conference to an end with a performance of their hit songs. ST.THOMAS-The Brothers with a Cause Association looks forward to a new semester with new members. The Brothers with a Cause Association hosted their induction ceremony, “Striving for Success,” at the UVI Administration and Conference Center on Sept. 6. The ceremony included several speakers like Stevie Henry, President Dr. David Hall and Attorney Carl Richardson. The goal of Brothers with a Cause is to increase the recruitment, retention and graduation rates of young men within the University of the Virgin Islands through strategic intervention at kindergarten to post-secondary education levels. These young men strive to improve academic achievement through brotherhood, leadership, community service and character development. “We are looking forward to implementing various programs for the year and welcoming our new brothers into the organization. BWC is essential to UVI. We plan on achieving our goals, promoting our vision and conquering our mission,” stated Lorenzo Scotland, treasurer of Brothers with a Cause. Brothers with a Cause will be taking part in the annual “Man Up” Conference as well as other events on and off campus. They also will be attending the high schools in St. Thomas to speak with the students about their futures and the importance of pursuing higher education. The new members are looking forward to being a part of upcoming projects. “We are distinguished young men with a purpose and I plan to leave my mark on UVI. 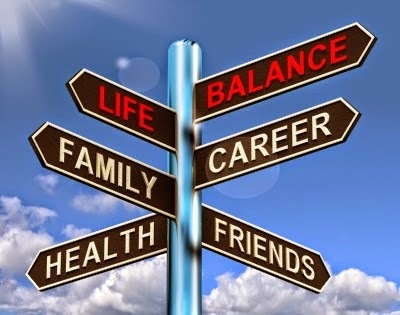 I am glad that I now have dependable people to look up to for guidance and inspiration on a daily. I don’t want to be another black male statistic and Brothers with a Cause will help lead me in the right direction,” said Xavier Jeffers, a new member of Brothers with a Cause. Jeffers was accompanied by his two roommates who came to show their support. The ceremony’s audience included staff, students and a few guests. Guest Speaker Attorney Carl Richardson gave a fascinating and motivating speech on his own life story. 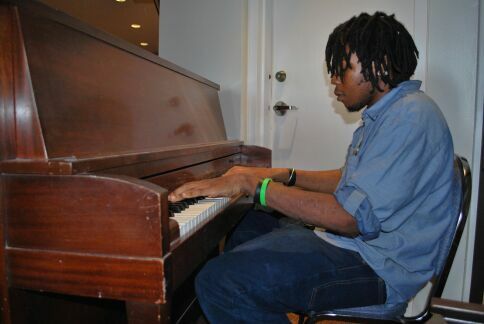 He spoke about his own trials and tribulations during his college experience and explained how he remained inspired. Richardson provided uplifting words of encouragement and reassured the young men of the Brothers with a Cause Association, that they can achieve anything with perseverance. “I have a lot of respect for these guys who dedicate themselves to making a difference in the Virgin Islands community. Our generation is often judged by senseless violence against one another, lack of motivation to educate ourselves and reprehensible behavior. Although I came to the ceremony to support a friend, I gained insight as to what Brothers with a Cause is all about,” said Malik Morrison, ceremony guest. At the end of the induction ceremony, the members of Brothers with a Cause Association pledged to adhere to a code of conduct, universally accepted principles of human kindness, building unity among males at UVI and giving best efforts to helping the association fulfill its mission. The Brothers with a Cause Association welcomes its new members and looks forward to expanding their organization. A Healthy Me, Is Drug Free! ST.THOMAS-The University of the Virgin Islands St. Thomas Campus took part in the international drug and alcohol abuse campaign, Red Ribbon Week, on Oct. 21-25. According to the DrugRDumb website, Red Ribbon Week is the oldest and largest drug prevention campaign in the country. The ultimate goal of the campaign is to promote a drug free America. Colleges have joined the cause as they celebrated this notorious battle against drug. Colleges are one of the most common places where drugs, such as alcohol and other substances can be found. The National Institute on Alcohol Abuse and Alcoholism found statistical evidence that shows about four out of five college students consume alcohol. To extinguish this alarming statistic, especially in UVI, the St. Thomas campus participated in a week of events that promoted a drug-free life. Activities such as poster presentations, Red Ribbon decorative competitions between dormitories, promissory drug free signings, and Open Mic night were implemented to get the students involved. “It is impossible to get students to completely stop drinking for the rest of their college lives but I was more than willing to make the pledge,” Clement Browne, a biology major, said. The dorms also participated in decorating their dorms showing Red Ribbon Week spirit. Dorm decorations included poster murals by West Hall Dormitory and red painted rocks, which formed the shape of a ribbon by the Middle Dormitory. In first place was the East Dormitory, which was adorned with red ribbon posters, streamers and balloons. “East Dorm definitely brought the competition and creativity. Their dorm was awesome,” Royer exclaimed. 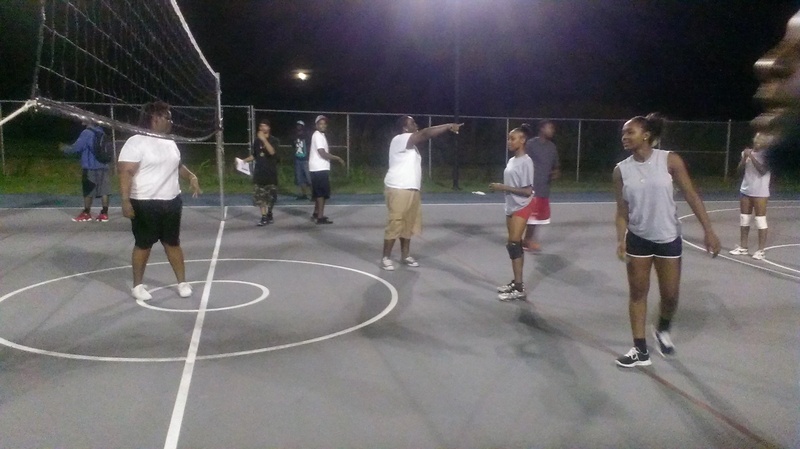 ST.CROIX – Students at the University of the Virgin Islands took part in the co-ed intramurals volleyball game Monday night behind the campus cafeteria just south of the campus dorms. 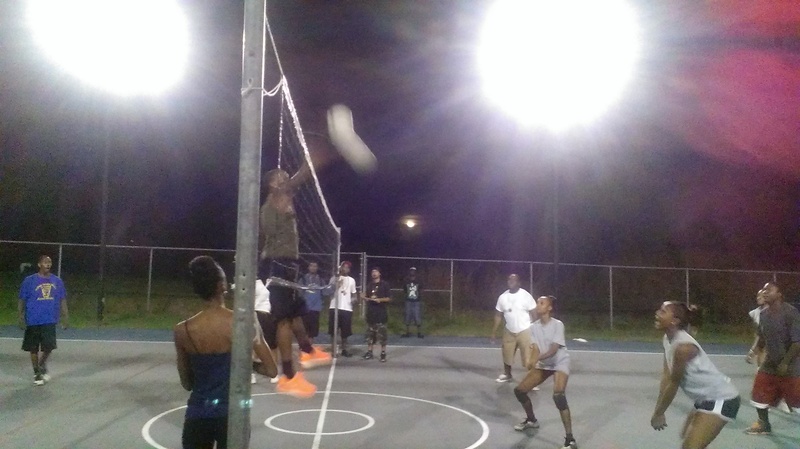 The volleyball season officially kicked off last week on Thursday night and usually starts each year in September. “Coach Bruce Ray has been doing most of the intramurals as far as putting the sport together and organizing the schedule here at the university and this year we started early,” Roderick Moorehead Jr. one of the coaches for the volleyball teams, said. The league plays every Monday and Thursday at 9 p.m. with a second game following immediately after. “If you want to take part in the sport you have to be somewhat serious. You can come and just play for fun but there should be a level serious interest in joining the teams,” Makeem Perinon said. Perinon is a part of the Virgin Islands Juniors National Volleyball team and is also a sophomore studying criminal justice. He heard about the student activity at the University and became immediately interested. He decided to take part and started his own team called Go Hard for the intramural league. The game is free to the public. It gives students on campus an opportunity to leave the dorms and enjoy a moment of interaction with other students on and off court. ST. CROIX –Finding a male student at the University of the Virgin Islands is equivalent to finding an Eskimo in the Caribbean. At the university, 31 percent of freshmen are male and 29 percent of all undergraduate students are male. The typical undergraduate student at UVI is a mature local woman attending full time. But why is this happening? Are young women simply more ambitious and harder-working? Are men becoming increasingly disengaged from academia? Female high-school students are more likely to aspire to attend college than their male counterparts and the young women enrolled in college, persist and graduate at higher rates as well, according to a report released on Aug. 28, 2012 by the National Center for Education Statistics. When young women graduate from high school they tend to go straight into college with a plan set on a four-year degree. Men decide to go college at a lower rate. For example, while almost three-quarters of female students who enrolled in college did so immediately after high school, just over two-thirds of male students did. Slightly less than half of young men first enrolled in a college or university. In high school women paid more attention to the college searches than men. They would consult college websites, publications or search guides for information on college entrance requirements. Only 60 percent of male seniors reached out to college representatives for information. Once in college, a higher percentage of women stay enrolled and graduate, according to the statistics taken by BYU in 2004. Roughly 60 percent of all first-time, full-time bachelor-degree-seeking students who started college in 2004 had earned an degree six years later from the same institution. A greater proportion of women finished than men. The purpose of higher education is to be more qualified for higher paying jobs. Women don’t typically go for jobs in construction or security, which don’t necessarily require a degree. So women try to get the edge with a degree.